David Copperfield came to school in Canterbury. It was easy for readers to believe that “the grave building in a court-yard, with a learned air about it that seemed very well suited to the stray rooks and jackdaws who came down from the Cathedral towers to walk with a clerkly bearing on the grass-plot” was based on the King’s School. Even more remarkable were the similarities between David’s headmaster Doctor Strong and Dr John Birt, who had been at King’s from 1816 to 1832. In particular, Birt’s young wife had deserted him. John Sidebotham (1830-1901) was a pupil at the King’s School from 1843 to 1848 under Birt’s successor, George Wallace. In 1865 he published Memorials of the King’s School, Canterbury. He sent a copy to Dickens and asked him about the resemblances between Birt and Strong. 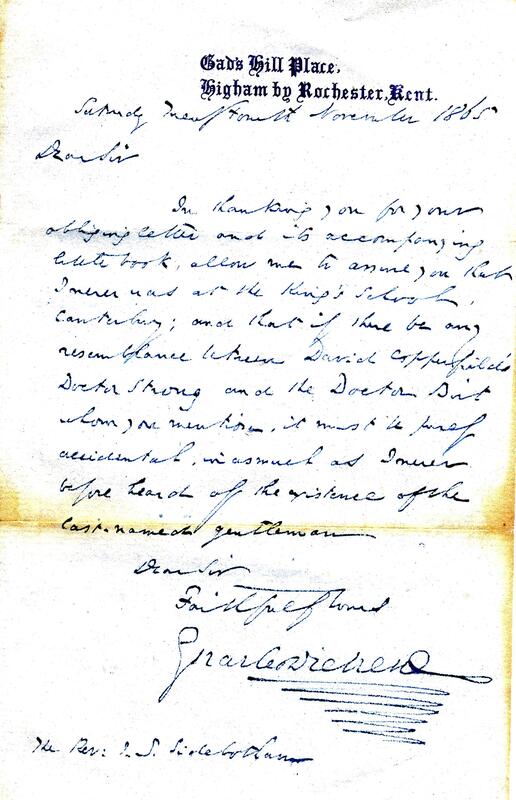 Dickens, in this letter dated 24 November of that year, not surprisingly replied that he had no knowledge of Dr Birt. “In thanking you for your obliging letter and its accompanying little book, allow me to assure you that I never was at the King’s School, Canterbury; and that if there be any resemblance between David Copperfield’s Doctor Strong and the Doctor Birt whom you mention, it must be purely accidental, inasmuch as I never before heard of the existence of the last-named gentleman.” Birt later became Vicar of Faversham and Headmaster of the grammar school there. He died in 1847, two years before David Copperfield appeared. 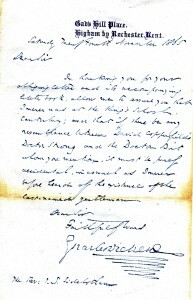 The letter was presented to the School by the Rev. C.E. Sidebotham in 1958.